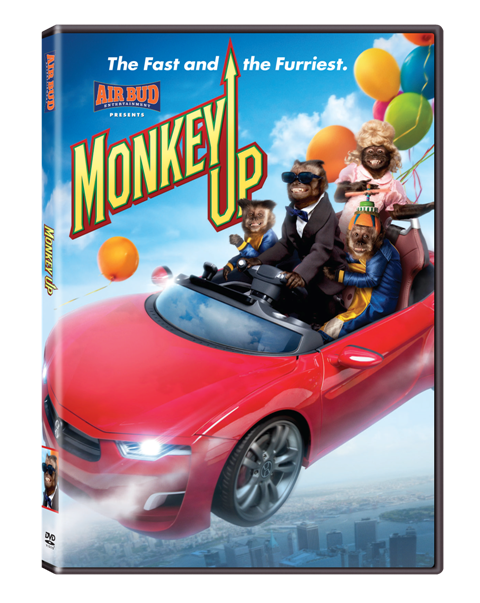 Air Bud Entertainment has just released Monkey Up for digital download! Looking for a family film for your next movie night? Monkey Up is fantastic new family film that stars Crystal the Monkey from Night at the Museum 1, 2, and 3, and We Bought a Zoo. This exciting adventure introduces Crystal’s character ‘Monty’ as the star of Monkey Up energy drink commercials, who is dreaming of breaking out of advertising to become an A-list player on the Hollywood scene. The greedy owner of Monkey Up has other plans for Monty, so the monkey escapes with the help of his new family, the Andrews, and his primate siblings, Mort, Mooner, and Melody in a hilarious chase. Together they help Monty discover that fame and fortune come and go, but family is forever! This is the first time Crystal the monkey has landed a starring role. Monkey Up has been rated ‘Family Friendly’ by The Dove Foundation, a recognition awarded to movies, DVDs, made-for-TV movies and specials, books and entertainment products that portray and encourage positive values. This is the kind of movie you WANT your kids to see! Monkey Up includes names like John Ratzenberger, David Milchard, Danny Woodburn, Erin Allin O’Reilly, Jonathan Mangum, and Skylar Astin as Monty's voice. Monkey Up is directed by Robert Vince. It is written by Robert Vince, Anna McRoberts, Kirsten Hansen, and Mary Pocrnic. It is produced by Anna McRoberts. Rated PG. Don't miss this great family film! The film will also be released in AMC theaters from January 22 - 31. The DVD will be available on February 2.